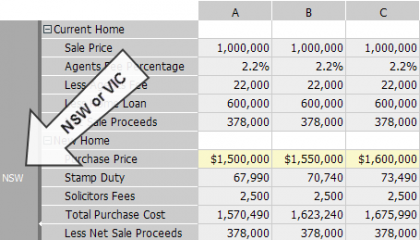 This model will help you to analyse the lending position where you or your client sells their current home and buys a new one. It presents various scenarios or sensitivities around the new home purchase price to help you understand the impact this has on LVR and repayments. Analyse selling your home and buying another. This Sell and Upgrade Analyser will enable you to calculate the size of the mortgage required and the associated monthly repayments when you sell your old home and use the net proceeds as the down-payment for your new home. 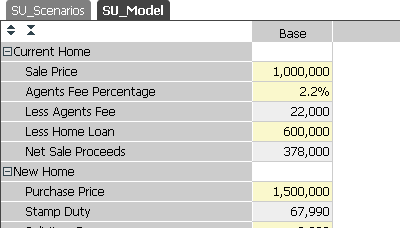 Two versions of this model are available: one with various inputs for the new home purchase price presented in a separate Scenarios tab, and the other with everything built into one single model. Try both and see which one suits you best. If you’re using the older model then the sensitivities around different new home purchase prices are contained in a separate tab. If you’re using the NEW! updated model, then everything you need is contained in the one model.